Emily, a sparky young Victorian lass, is embarking on a long voyage to Australia, where her mill owner father wants to investigate new business opportunities. Emily does not want to go, but her voyage is almost immediately enlivened when she meets Thomas – a young lad from a much poorer background than her own - and notices a rat peeking out from his pocket. Thomas has sneaked his pet on board, and Emily is soon involved in helping the rat, Barney, to avoid capture. While Emily’s genteel mother has the vapours in the first class drawing-room, Emily is soon involved in a satisfying adventure. It brings her into contact for the first time with children far below her own social sphere, and leads her to question her own assumptions about her family’s wealth and ethics. She finds she knows very little about the mills which are the source of her family fortune, and which Thomas has experienced at first hand; still less about the dreaded work-houses. 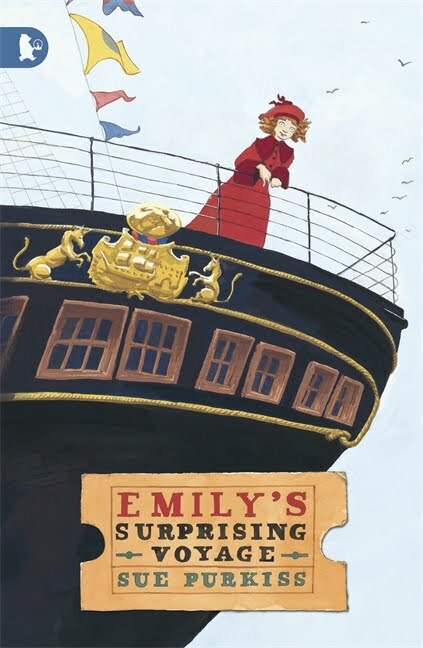 Emily’s Surprising Voyage is that very unusual thing: a straight piece of historically accurate fiction for children, with no fantastical elements tagged on, and even more unusually it is aimed at 7-9s, whose fictional opportunities sometimes seem limited to fantasy or the present day. The ship Emily sails on is a real ship: the SS Great Britain, which was the first-ever iron ship, designed by the renowned Victorian engineer, Brunel. As well as providing a fascinating setting, it is a clever means of bringing together characters who would normally never meet. All this is powerful stuff for a child: as I found when I gave this book to a seven-year old, who was completely over-whelmed to read for the first time of the poverty suffered in a by-gone age. A truly broadening read – and a great jumping-off point for discussion, at home or school. Part of Walker’s Racing Reads series, this is also an absolutely beautifully produced book, with a gorgeous cover and wonderful illustrations by James de la Rue. Thanks, Emma - what a lovely review! And i do agree about the illustrations, cover and production - I was so delighted with them. This looks fabulous Sue, I am going to seek it out today! Been slow to post comments because it hasn't been working for me but am looking forward to reading this Sue and hope this posts!!! Yeah! It posted. I changed to Chrome rather than Internet Explorer. Makes all the difference. Phew! What a battle. And what relief now!